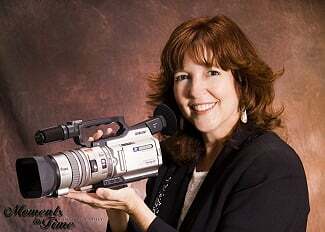 Home / Leslie's Blog / Sarasota videographer gives advice for your wedding video. State-of-the art digital video cameras, extensive experience, a sharp eye-for-beauty, and a passion for video production are equally important. I think of myself as a Sarasota’s premier storyteller and expert wedding videographer. As a veteran broadcast TV producer in Sarasota, the challenge for me is to create memorable, compelling videos that you’ll enjoy for generations to come. I use storytelling techniques to create wedding videos that is both captivating and captures memories with emotional impact. As a Sarasota videographer, I can tell you that editing makes a huge difference in the value of your wedding videography; allowing for fine tuning of the video footage. At Visions Unlimited Video Productions, we edit soundtracks of music, titling/ graphics, video special effects, color correction, slow motion video, etc. Without video editing, what you’re left with are long video clips that can visually bore viewers to death. It’s best, at least, to “clean up” video footage and sweeten audio. Even the best wedding videographer in Sarasota might capture someone on camera scratching their nose (or other embarrassing body part.) It might be wedding guests in the background, or your brides maid “up front and center.” It’s a good idea to edit these video clips out of the Wedding Video/master DVD, to avoid embarrassment and to keep the romantic mood, of your special event, in your wedding video. You want to invest in the best Sarasota videographer you can afford! ~Meet the newest addition to our family of video cameras, the Sony HXR-NX5U. Capturing spectacular video, this HD digital video camera has the ideal balance of power and performance in the digital age. The large HD video camera lens and modern technology allows us to capture your wedding reception in dark reception halls. We can keep our lights down to a minimum, and still shoot the vibrant vivid colors of your bridal bouquet, head table, wedding cake, party favors & decorations. This superior video camera helps videographers retain the ambiance & atmosphere of your first dance and ambient mood lighting. Experienced professional videographer will stay ahead of the action and shoot a variety of angles; trying to film several different clips of each important moment of your wedding. This is hard work, and a lot more difficult than it looks. Well meaning friends my offer to shoot your wedding video but it will be a sad embarrassment for them, and disappointment for you when they just can’t quite video tape your wedding. There’s a lot more involved than you may realize to capturing your priceless wedding memories unobtrusively with style. Do yourself a favor on your Wedding or Vow Renewal day. Hire full time professional videographers in Sarasota to produce your spectacular wedding video. It’s a good investment to capture all those things you spent so much money on; the details in your wedding dress, your gorgeous hair & make-up, the fabulous wedding venue and reception location, your wedding flowers & cake, wedding favors & decorations… your jewelry & shoes! Typically, your wedding videography investment is a small percentage of your entire wedding budget. Think about upping that percentage a bit to hire the best videographer you can, and you will be so happy afterwards. Imagine coming back from your honeymoon and being able to relive the passion of your vows & ring exchange, the humor in your best man’s toasts, and the excitement of cutting your wedding cake. Maybe you’ll share your wedding DVD with grandchildren one day. These priceless memories can be preserved in a flattering light, with style and sophistication when captured buy a true professional videographer with the proper equipment, creativity, integrity and experience. Accept nothing less. Make sure your sarasota videographers is getting true HD quality on your DVD. Ask about upgrading to a Blu-ray Disc or sharing your wedding video on-line. Ordinary DVDs may not retain the highest quality of your wedding video, even if it’s shot with professinal HD cameras and edited with HD editing software. My camera is my main tool, just like a novelist would use a typewriter. It’s been said that “anyone can own a typewriter, but not everyone can be a good novelist.” It’s the same with cameras: owning a video camera does not make you a film maker & story teller, especially today with so many smart phone cameras. We also create videos in Bradenton, Venice, Boca Grande, Siesta Key, North Port, Casey Key, Palmetto, Longboat Key, Tampa Area and Anna Maria Island.